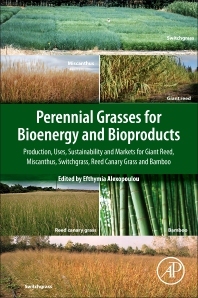 Perennial Grasses for Bioenergy and Bioproducts: Production, Uses, Sustainability and Markets for Giant Reed, Miscanthus, Switchgrass, Reed Canary Grass and Bamboo brings together a team of international authors to explore the current utilization, sustainability and future perspectives of perennial grasses in the bioeconomy. The book begins by examining the role of these crops as feedstock for bioenergy, in particular advanced biofuels and bioproducts. It then offers five chapters, each covering one perennial grass type, namely giant reed, miscanthus, switchgrass, reed canary grass and bamboo. The book covers their breeding, cultivation, harvesting, pre-treatment, economics and characterization. The book goes on to present the thermochemical conversion pathways for different types of feedstock. The last chapter explores issues concerning sustainability of perennial grasses, including their production in marginal lands. This thorough overview is a helpful reference for engineering researchers and professionals in the bioenergy sector, whose understanding of feedstock characterization, sustainability and production is critical in the development of conversion technologies. Those in the industrial crops sector will benefit from discussion of various issues surrounding crop production, which can guide their feedstock cultivation, harvesting and pre-treatment for specific conversion processes or end use. The book is also a useful resource for instructors and students in Masters and PhD programs in the area of biomass and energy crops. Policy makers and government agents involved in regulating the bioenergy and bioproducts sector will find comprehensive information to guide their decision making. Efthymia Alexopoulou is an agriculture engineer with a PhD on adaptability and biomass productivity of the non-food crop Kenaf in Greece. She is responsible for the Energy Crops Unit of the Biomass Department at the Center for Renewable Energy Sources and Saving. She has several years of RTD experience on energy crops such as kenaf, switchgrass, giant reed, miscanthus, sweet sorghum, cardoon, rapeseed, castor etc. She was also the coordinator of three EU research projects: BIOKENAF (“Biomass production chains and growth simulation model for kenaf”, 4FCROPS (“Future Crops for Food, Feed, Fiber and Fuel”) and FIBRA (“Fibre Crops as a sustainable source of biobased material for industrial products in Europe and China”). Dr. Alexopoulou has been Involved in several R&D projects for CRES, the most recent being the OPTIMA project, an EU research project dedicated to perennial grasses research, a sister project with two other EU projects working on the same subject (OPTIMISC and GRASS MARGINS). She was co-editor of a book on Kenaf, has presented in several international conferences and published many papers on international journals. She was guest editor in two special issues of Industrial Crops and Products (Volume 68 and Volume 75), in which presented part of the findings of FIBRA project.